Maria A Flores has lived 29 years in Las Cruces, with her husband, and raised 3 chilldren, all LCPS High school graduates. All three went on to graduate from college in 4 years,and on to professional schools. She is originally from Los Angeles, CA, spoke only Spanish, learning English by 2nd grade. 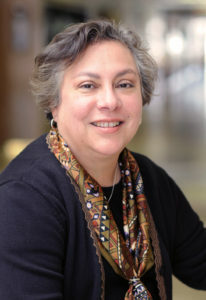 She attended Whittier College, doing a semester in Mexico City, and a year at New Mexico Tech, and received an MA from Michigan State University in Spanish Language and Literature and Bilingual Education. She has taught for 17 years while raising her family, working as a volunteer at their schools, and helping her husband build his practice. She has taught 12 years at Tombaugh Elementary as a Bilingual 4th and 5th grade teacher. She will formally retire this year. After working on the Obama 08 campaign, she was asked if she would run for office, emphatically answered no, and then a week later declared her candidacy for School Board District 3. It was a natural fit, and has been an honor to serve for 2 terms, being recently reelected this year for her 3rd. She calls this year’s board and Superintendent, “the dream team with no money”. She believes in speaking for those students and families that don’t have a voice.